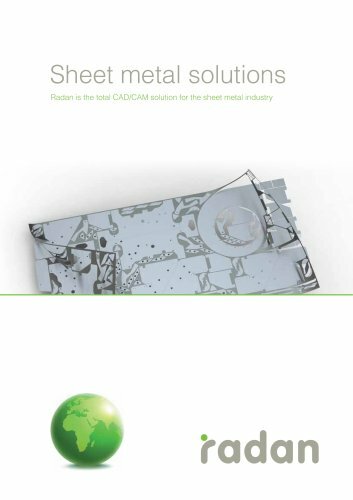 The complete process... Radan is the total CAD/CAM solution for the sheet metal industry We understand that metal is precious in your business, and with our software your company can significantly reduce inventory and increase material utilisation, allowing you to realise true return on your investment. Our strength is in providing world class innovative solutions that give you the software applications that are essential to design, manufacture and control production of sheet metal components and products. Multi-Axis Profiling Multi-axis laser technology for 3D sheet metal components Radtube is an industry leading Laser CAD/CAM system for rotary and multi axis cutting machines developed specifically for the tube cutting industry. Radm-ax has been developed specifically for the general engineering, automotive and aerospace industries with a wealth of in-built features that allow for the optimisation of the laser toolpath. Nesting Efficiency Advanced true shape nesting Radnest is a highly efficient nesting package that enhances either Radpunch or Radprofile. Incorporating fully generalised nesting that analyses the true shape of components, Radnest can dramatically increase sheet utilisation and deliver substantial material cost savings. By using Radnest, you can expect to produce more components from less material a shorter time. The efficiencies gained have a significant effect on profit, enabling you to manufacture parts from material that would have previously been in the scrap bin.